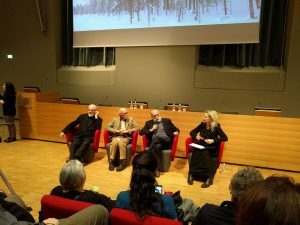 Yesterday, in Turin, the conference with Franco Berrino, Carlo Petrini and Michelangelo Pistoletto as protagonists. Agriculture, food, society and art: here’s how the journey among the knowledge and the experiences of the three speakers went. 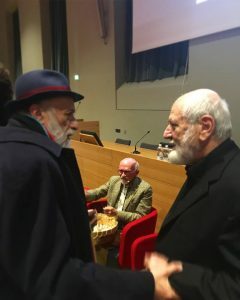 Yesterday evening, the lecture hall Cavallerizza of the University of Turin hosted the conference “The Three Oaks”, with special guests Franco Berrino, doctor and founder of the association “La Grande Via”; Carlo Petrini, sociologist and founder of the association “Slow Food”; and Michelangelo Pistoletto, the artist from Biella. The event ended up being a sort of cultural journey among the experiences of three great minds engaged in spheres of reference distant from one another, but whose lines of thought often met on many of the issues raised in the course of the evening. It felt in fact like a flux, which harmonically enveloped and connected the words of the “three oaks”. The audience anticipated and reflected the richness and variety of the contents expressed during the conference: the lecture hall was full of participants of every generation, with a great many youths present. The moderator of the conference Eija Tarkiainen (Rebirth / Third Paradise ambassadress) introduced the evening and cleverly managed the jigsaw puzzle of notions and tales of the three protagonists. The event didn’t follow a strict programme: the reflections, not steered or timed, were naturally expressed with simplicity. 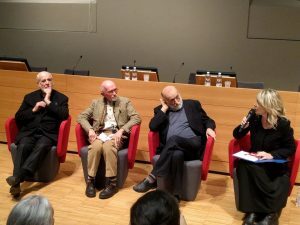 The participants joined the journey led by Berrino, Petrini and Pistoletto, travelling through their past experiences, their passions and their commitment to society. The three of them are in fact figures of reference for three organizations (La Grande Via, Slow Food and Cittadellarte) engaged, with different instruments, in a responsible transformation of society and in urging the collectivity to a virtuous change. The speakers were not three authoritarian figures under the spotlights, but three old friends discussing life macro-themes sipping a coffee (or a freshly-squeezed juice of seasonal and locally produced fruit, in line with their “eating healthy” policy). Different subjects were at the centre of their public debate: agriculture, food, society and art; topics that were linked and declined in their different aspects. 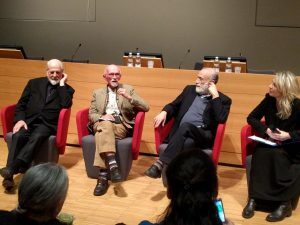 But let’s go into the highlights of each protagonist: Carlo Petrini talked about agriculture, explaining the importance of “good company” in the activation of new virtuous practices. “To generate change, – he said – it is fundamental to make things happen together with people who make you feel good”. In this regard, the founder of Slow Food analysed what he considers key words: “regeneration” and “co-producer”, the latter – making feel the individual responsible – replaces the abused term “consumer”. Petrini also mentioned a few curiosities from the vegetable world, creating a parallel between the inner composition and “functioning” of the olive tree (in which each section has a precise task operating for the good of the plant) and the structure of society. Besides, he reasoned on the importance for the individual to have the opportunity to make mistakes and start all over again. Still on the subject of collectivity, he explained: “The happiest of the happiest is the one who helps others be happy”. Michelangelo Pistoletto placed society at the centre of his speech, which he opened exposing the failure of democracy, stressing how the power of people (from the ancient Greek demos for ‘people’ and kratos for ‘power’) is a utopian concept, considering that their representatives are too distant too many times from their actual needs. The solution is in demopraxy (the term, coined by Cittadellarte’s director Paolo Naldini, is centred on praxis, meaning ‘action’, in the sense of ‘doing’). Applying it, the actions of people can be at the centre of the process of achieving freedom and social balance. The artist then focused on his sign-symbol, the Third Paradise, illustrating its specificities and explaining the concept of trinamics. Demopraxy could actively be the key to a more responsible food consumption: “If we changed our food regimes – he said – we could destabilise the economies which speculate on the health of the individuals”. At the end of the conference, the moderator Tarkiainen allowed for a Q&A. One of the main themes raised was beauty: the three oaks gave the term three different interpretations, which impressed the audience. Pistoletto discussed it in reference to art, isolating beauty from the strictly aesthetic connotation usually attributed to it; Berrino focused on an ontological type of beauty; Petrini – after mentioning that in the Jewish culture the concepts of “beautiful” and “good” are included in the same word – highlighted its relationship with another word: “You can’t have beauty without passion”. In the lecture hall Cavallerizza the seeds of the beauty of a responsible social transformation have been sown and they are ready to sprout. Please see our previous article (and the text by Eija Tarkiainen) for further information. 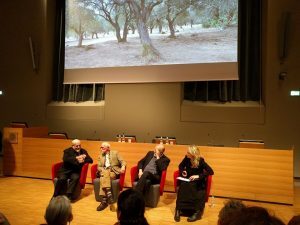 The conference was coordinated by “La Grande Via”, “Slow Food” and “Cittadellarte – Fondazione Pistoletto”, with the support of “Italia che Cambia” and “La Finestra sul Cielo”.